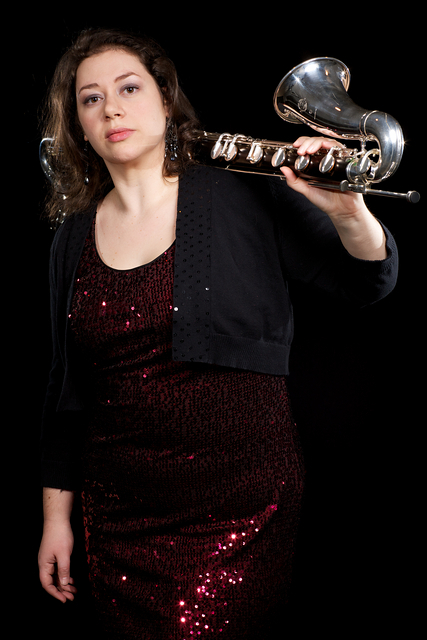 Laura Armstrong is a clarinetist and saxophonist currently living in Baltimore, MD. She is a faculty member of Frederick Community College, where she teaches clarinet and saxophone. Recently, she has also conducted clarinet and saxophone ensembles at Shippensburg University. Dr. Armstrong has performed in recitals in the Mid-Atlantic region and has performed as a soloist at the 2012 International Clarinet Association’s ClarinetFest held in Lincoln, NE. Laura also performed Weber’s Second Clarinet Concerto with the Frederick Symphony in 2014. Along with Alicia Kosack, flute and Kimberly Buchar, bassoon, Laura is clarinetist and founding member of the Fortunata Trio. Together they have performed throughout the Baltimore-Washington area, on concert series at Dickinson College, York College, and at the National Flute Association’s 2013 conference in New Orleans, LA. They seek to commission and promote works for the unusual combination of flute, clarinet, and bassoon. As a freelance orchestral performer, Laura has played with a variety of orchestras including the Lancaster Symphony Orchestra, Maryland Symphony Orchestra, Shippensburg Festival Symphony, HUB Opera Ensemble, and the Honolulu Symphony. She is also an advocate of contemporary music and performs with new music groups based in the Baltimore/Washington region. Laura received her Doctor of Musical Arts degree in Clarinet Performance from the University of Maryland in 2010 and presented parts of her dissertation, as part of a research competition, in a lecture recital at the 2011 International Clarinet Association’s ClarinetFest in Los Angeles, CA. She also holds performance degrees in clarinet from Duquesne University and Susquehanna University. Her principal clarinet teachers have been Paul Cigan, Ron Samuels, and Valerie Martin. She has also studied saxophone with Ron Bixler and Gail Levinsky. In 2015, Laura started her own reed making business, Aurora Winds.